Dhunay is betting that Ambyint’s sophisticated artificial lift optimization technology can do just that – catching potential problems with pumps before they occur to boost oil production and lower operating and maintenance costs. Ambyint harnesses the power of “connected machines,” says Dhunay. It uses lightweight sensors, wireless communications and predictive data analytics, to automatically make tiny adjustments to an oil well’s pump stroke and detect minor problems before they become major. Ambyint was born out of PumpWELL Solutions, which collected the data used to develop the algorithms during its 10 years in operation. Two of PumpWELL’s long-time clients – Bonavista Energy and PennWest Exploration – have been using the new system, which is due for general release Sept. 1. The lower price makes it affordable for all wells, even those nearing the end of their production cycle, says Dhunay. “One client estimated the solution could save anywhere from $100,000 to $150,000 per year by putting it across all their oil wells,” he adds. Given the recent drop in oil prices, says Peter Garrett, CEO of incubator Innovate Calgary, tech companies that are able to show an immediate return on investment for oil producers are the ones most likely to get funding and attract clients. Nonetheless, innovations do occur. “The main areas of concern in the oil sands tend to be lowering production costs, reducing the environmental footprint and the ‘digital oilfield’ – using innovative new technology in the oil field,” says Garrett. Cenovus Energy, for example, has been using a $30,000 commercial drone to map sites in Northern Alberta, while Suncor Energy Inc. has ordered 175 driverless trucks from Komatsu Ltd. in Japan. The trucks use GPS to navigate, can drive in day or night and never have to stop to sleep, eat or, ahem, eliminate. Meanwhile, University of Calgary spinoff nFluids Inc. is taking aim directly at operation costs with a drilling fluid additive that incorporates nanoparticles to reduce drilling fluid loss. “Drilling fluid represents about 10 per cent of the total cost of drilling a well,” says Jeremy Krol, vice president, corporate development at nFluids. It cools the drill bit, removes cuttings and lubricates the well bore. “The loss of drilling fluid into the cracks and pores of the surrounding geology is not only a safety risk but also very costly with negative environmental consequences,” Krol says. nFluids’ product aims to reduce fluid loss by 30 per cent, as well as “reducing friction and providing increased strength to the well bore,” he says. The result: Operators should be able to trim total energy requirements and the cost of the drilling process. Christopher Beadle, vice president of sales and marketing for Intelliview Technologies of Calgary, holds out hope for a turnaround in the industry as well. His company’s thermal video surveillance system was first used for lane tracking in speed skating. 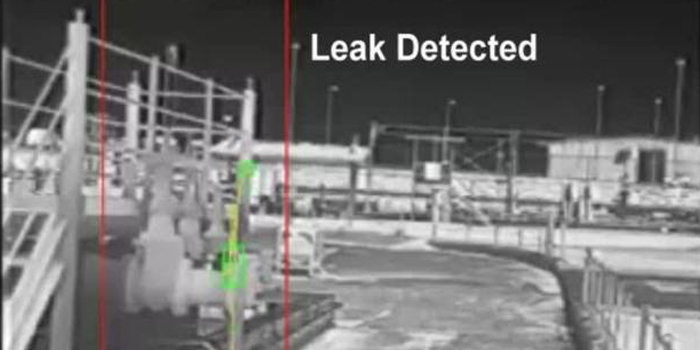 But five years ago Enbridge Inc. approached Intelliview with a question: Could it use its technology to discover oil leaks the size of a piece of paper? Intelliview’s thermal cameras detect temperature changes of two degrees or more. Because the fluid in a pipe is normally warmer or colder than the outside air, even small leaks activate the camera to send a photo and video clip to a monitoring centre. Oil companies would most likely use the cameras to detect problems at pump stations, where seals, valves and vibrations result in most leak, says Beadle. But they’re also useful for sensitive areas of pipeline – those that span water, for example – or to pick up security threats.